Cliff House has got to be in one of the most outstanding locations in North Devon. Standing majestically in a terrace of 3 similar properties, overlooking Combesgate Beach at the Mortehoe end of Woolacombe Bay. It has 3 bedrooms sleeping 6. The living room and kitchen/diner and the front two bedrooms have incredible sea views and the terrace in front of the house is a south facing sun trap and enjoys far reaching panoramic views across to Lundy Island, Baggy and Hartland Point and over the entire Woolacombe Bay to Putsborough; a truly idyllic spot! Cliff House is next door to Overcombe and Sealoft. On entering the double fronted property, the door to the kitchen diner is on your left. This room has a pine dining set and dresser and a modern fully equipped kitchen with dishwasher, gas oven and hob, integrated fridge and music system. In the useful utility room off the back of the kitchen there is a washing machine (no dryer) and integrated freezer. The downstairs cloakroom with WC is off this room. The living room runs front to back of the house and has an outstanding view to the front from the lovely wide opening window over to the sea. There is ample seating, coffee table and TV/Video/DVD and WiFi. Upstairs there are three bedrooms and small family shower room. The master double room has a refitted en-suite bathroom with separate shower, WC and basin. This is a spacious bright bedroom with wardrobe, chest of drawers and again, that amazing view. The other front bedroom has a double bed, wardrobe and chest of drawers. 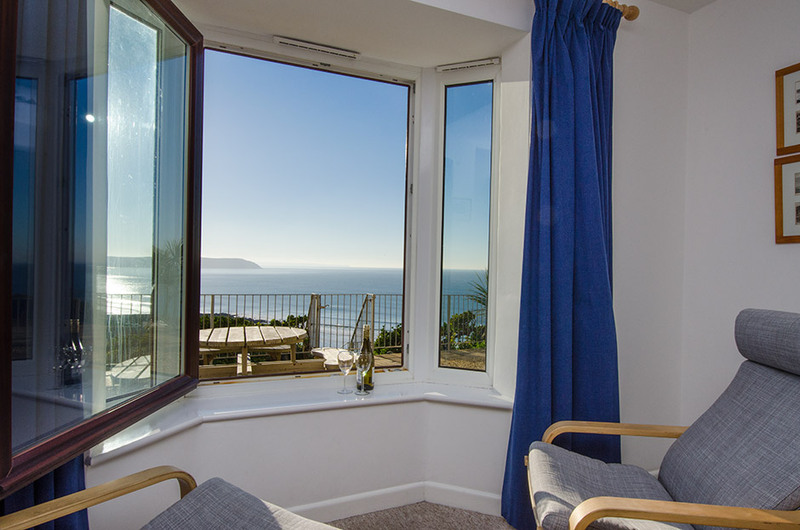 The sea view is great from this room out to Hartland and all across the beaches. The third and smallest bedroom has bunk beds so this lovely house can sleep 6 people in 3 bedrooms. There is a newly fitted shower room with shower, WC and basin between the front and 3rd bedroom. Please note there are staggered steps up from the parking area. The owners have ensured that the house is well equipped, well presented and has simple charm. Be quick to avoid disappointment, as this property will book early! There is strictly 1 parking space and use of garage if you are bringing a second car (please advise).